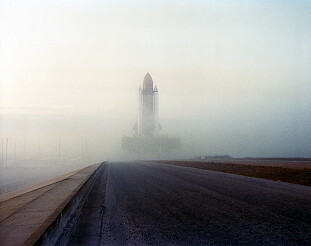 The launch was first scheduled for December 18, 1989, but was later postponed to complete and verify modifications to Pad 39-A. 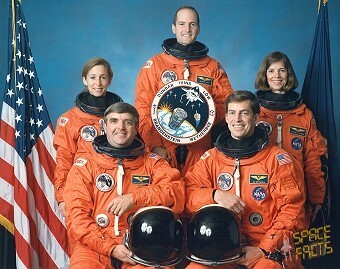 The second scheduled launch on January 08, 1990 was aborted due to weather conditions. 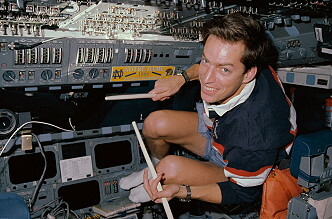 The primary objectives of the mission were the deployment of the Syncom IV-F5 Navy synchronous communications satellite (also known as Leasat 5), and to retrieve NASA's Long Duration Exposure Facility (LDEF) launched aboard Challenger on mission STS-41C in April 1984, whose retrieval had been delayed for 4 ½ years by scheduling changes and the Challenger disaster of 1986. Columbia also carried several secondary payloads involving material crystal growth, microgravity protein crystal growth, lightning research, in- flight cardiovascular changes and effects of microgravity and light on the cellular processes that determine circadian rhythms and metabolic rates. The deploying of defense communications satellite Syncom-IV-F5 occurred on flight day two. Syncom IV-F5, also known as LEASAT 5, was the fourth operational satellite in the LEASAT system. It was leased by the Department of Defense to replace the older FleetSatCom spacecraft for worldwide UHF communications between ships, planes and fixed facilities. A Hughes HS381 design, the LEASAT spacecraft was designed expressly for launch from the Space Shuttle and uses the unique "Frisbee", or rollout, method of deployment. 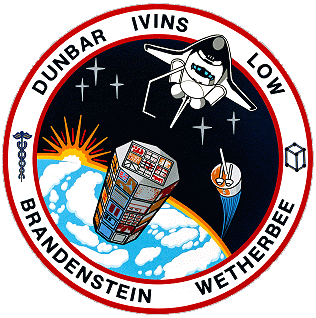 The first two spacecraft were deployed during the 1984 STS-41D and STS-51A Shuttle missions. LEASAT 3 was deployed successfully in 1985 during mission STS-51D but failed to activate. The satellite drifted in low-Earth orbit until a salvage and rescue mission was performed by the crew of mission STS-51I in September 1985. Following a series of modifications by the Shuttle crew, LEASAT 3 was successfully deployed into its operational orbit. Also as part of mission STS-51I, LEASAT 4 was successfully deployed from the orbiter. However, it did not go into operational service due to a spacecraft failure shortly after arrival at geosynchronous orbit. Interface between the spacecraft and the payload bay was accomplished with a cradle structure. The cradle held the spacecraft with its forward end toward the nose of the orbiter. Mounting the antennas on deployable structures allowed them to be stowed for launch. Five trunnions (four longeron and one keel) attached the cradle to the orbiter. Five similarly located internal attach points attached the spacecraft to the cradle. 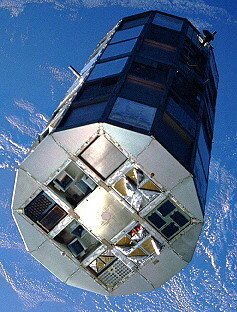 Another unique feature of the Syncom IV series of satellites was the lack of requirement for a separately purchased upper stage, as had all other communications satellites launched to date from the Shuttle. 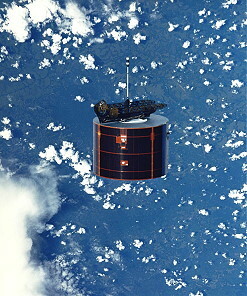 The Syncom IV satellites contained their own unique upper stage to transfer them from the Shuttle deploy orbit of about 160 n.m. (296 km) to a circular orbit 19,300 n.m. (35,743 km) over the equator. Each satellite was 20 feet (6.1 meters) long with UHF and omnidirectional antennas deployed. Total payload weight in the orbiter was 17,000 pounds (7,711 kg). The satellite's weight on station, at the beginning of its life, was nearly 3,060 pounds (1,388 kg). Hughes' Space and Communications Group build the satellites. 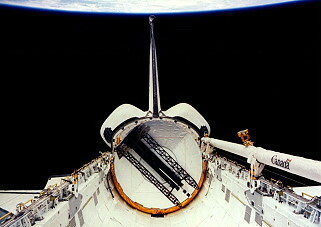 Ejection of the spacecraft from the Shuttle was initiated when locking pins at the four contact points were retracted. An explosive device then released a spring that ejects the spacecraft in a "Frisbee" motion. This gave the satellite its separation velocity and gyroscopic stability. The satellite separated from the Shuttle at a velocity of about 1.5 feet (0.46 meter) per second and a spin rate of about 2 rpm. LDEF was delivered to Earth orbit by STS-41C on April 06, 1984. The orbiter Columbia rendezvoused and retrieved LDEF using a -R BAR approach and the remote manipulator system (RMS) for berthing of the spacecraft in the payload bay on flight day four. As the orbiter neared LDEF, the -R BAR approach was initiated. The orbiter first passed below the spacecraft and circled up and over it. The - R BAR approach was a new technique that does not require close-in fly-around. This maneuver faced the payload bay toward Earth and LDEF was now between, as well as perpendicular, to both the Earth and the orbiter. At this point, Columbia was approximately 400 feet (121.9 meters) from LDEF with the RMS arm extended and the wrist camera pointing toward the orbiter's starboard side. The wrist camera provided the primary field of view for grapple. A yaw maneuver then was performed to place the wrist camera in the same x,y plane as grapple fixture 2 (GF2) aboard LDEF, so that the camera could eventually view GF2 head on. LDEF was then directly "above" the crew compartment (the arm was still in its same position; unattached to the LDEF). This allowed Commander Daniel Brandenstein and Pilot James Wetherbee to make necessary flight instrument changes to "fly in formation" with the same speed and direction as the free-flying LDEF. Next, the orbiter moved forward (+ZLV) very slowly. The crew was watching their onboard monitor for the LDEF to appear in the wrist camera's field of view. As soon as GF2 was spotted, orbiter movement was ceased. The wrist camera then rotated 180 degrees to be properly positioned for the grapple of GF2. Mission specialist Bonnie Dunbar then directed the RMS toward GF2 and made the connection for grapple completion. LDEF was approximately 35 feet (10.7 meters) above the bay during this procedure. The onboard computer then commanded the arm to align LDEF with the berthing guides on the payload bay sides. The final RMS maneuvering now was commanded manually to set LDEF in the bay. The crew also utilized the black and white camera positioned at keel station 3 aiming it at a docking target. The crew was watching the on-board monitor with an overlay for precision berthing. Three orange Styrofoam balls called "berthing whiskers" were extended horizontally inward from the forward payload bay side walls. The berthing whiskers acted as "curb feelers" to detect forward movement of LDEF. The arm now detached from GF2 and moved to GF1, looking for the six Experiment Initiator System (EIS) indicators. If the EIS's were black, the experiments power supply was already off. If they were white, the arm moved into GF1 and turned off the experiments. Finally, the arm was stowed. LDEF was a 12-sided, open grid structure made of aluminum rings and longerons (fore-and-aft framing members). The structure was 30 feet (9.1 meters) long, 14 feet (4.3 meters) in diameter and weighed 8,000 pounds (3,628 kg). LDEF's center ring frame and end frames were of welded and bolted construction. The longerons were bolted to both frames, and intercostals (crosspieces between longerons) were bolted to the longerons to form intermediate rings. 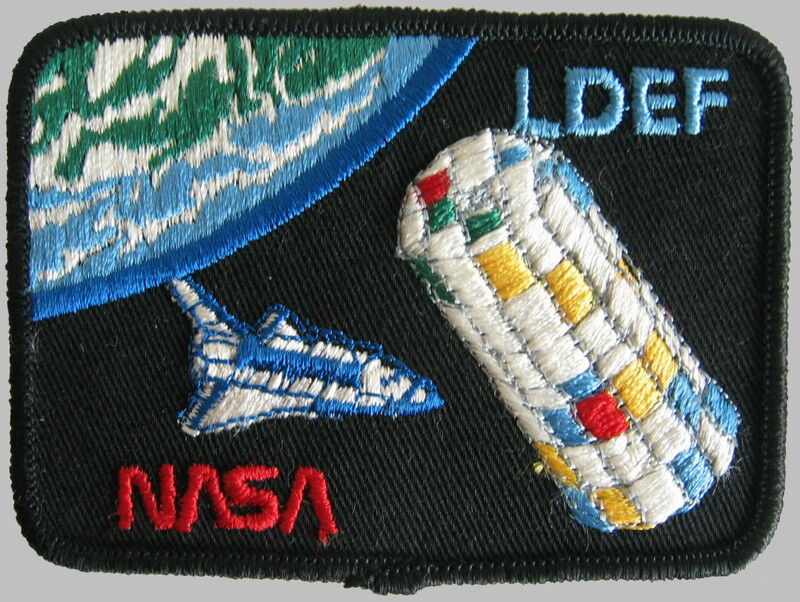 The main load of LDEF was transmitted to the orbiter through two side-support trunnions on the center ring. LDEF hold 86 experiment trays, 72 around the circumference, six on the Earth-pointing end and eight on the space-pointing end. A typical tray measured 50 inches (1.27 meter) by 34 inches (0.86 meter) and investigators could choose one of three depths: 3, 6 or 12 inches (0.08, 0.15 or 0.30 meter). The trays were made of aluminum and hold experiments that weighed up to 200 pounds (90 kg). Some experiments filled more than one tray; some filled only part of a tray. All trays and their experiments weighed only 13,400 pounds (6,078 kg). Total weight of the structure, trays and experiments was 21,393 pounds (9,703 kg). The timeliness of the retrieval was of critical importance, because a high rate of solar flux had increased the density of the LDEF's orbital environment and accelerated its rate of orbital decay. Specialists who carefully monitored the stability of the craft's orbit had anticipated that if the LDEF was not retrieved in time, it would pass too low for the shuttle to safely reach, and could be destroyed during re-entry in February 1990. Thus, the mission's exact liftoff time was determined about 12 hours before launch, using the latest tracking data on LDEF. It was flown on a 352 kilometers (190 nmi) orbit inclined 28.5 degrees to the equator. 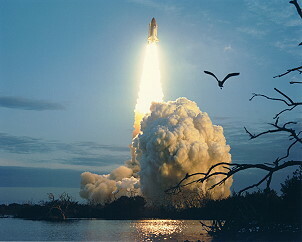 The retrieval had been delayed for 4 ½ years by scheduling changes and the Challenger disaster. The retrieval of LDEF was recorded with an IMAX camera, and appeared in the IMAX movie "Destiny in Space" in 1994. Earth observation footage from the camera also appeared in the 1991 movie "Blue Planet". The American Flight Echocardiograph was an off-the-shelf medical ultrasonic imaging system modified for Space Shuttle compatibility. The AFE noninvasively generated a two-dimensional, cross-sectional image of the heart or other soft tissues and displayed it on a cathode-ray tube (CRT) at 30 frames per second. 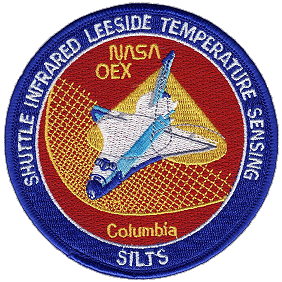 AFE has flown before on STS-51D and was designed to provide in-flight measurements of the size and functioning of the heart and record heart volume and cardiovascular responses to space flight. Results from the AFE were used in the development of optimal countermeasures to crew cardiovascular changes. 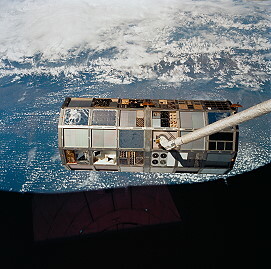 Operated by STS-32 Mission Specialist Marsha Ivins, the AFE hardware was stored in an orbiter middeck locker. 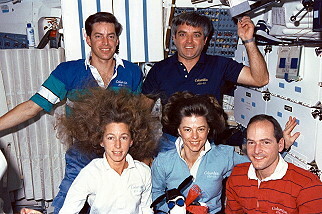 All five crew members participated in the experiment as subjects as time allows. Crew members also used the AFE to support Detailed Secondary Objective 478, the first flight of a collapsible Lower Body Negative Pressure unit. Characterization of Neurospora Circadian Rhythms (CNCR) in Space was a middeck payload sponsored by the Office of Space Science and Applications, Life Sciences Division. The objective of the CNCR experiment was to determine if neurospora (pink bread mold) circadian rhythm (diurnal cycles) persists in the microgravity environment of space. This experiment was intended to provide information about endogenously driven biological clocks, which might then be applied to other organisms. Endogenous indicates the activity occurs within a single cell's outer membrane. Neurospora grows in two forms, a smooth confluence of silky threads (mycelia) and cottony tufts of upright stalks tipped with tiny ball-shaped spores (conidia). When growing in a constant, completely uniform external environment, the neurospora mold cycles rhythmically from one growth form to the other. This cycle causes the mold to produce the ball-shaped spores on approximately 21-hour intervals. This interval is believed to be controlled by an internal cell clock. The Protein Crystal Growth (PCG) payload aboard STS-32 was a continuing series of experiments that may prove a major benefit to medical technology. These experiments could improve food production and lead to innovative new drugs to combat cancer, AIDS, high blood pressure, organ transplant rejection, rheumatoid arthritis and many other diseases.Protein crystals, like inorganic crystals such as snowflakes, are structured in a regular pattern. With a good crystal, roughly the size of a grain of table salt, scientists are able to study the protein's molecular architecture. Determining a protein crystal's molecular shape is an essential step in several phases of medical research. Once the three-dimensional structure of a protein is known, it may be possible to design drugs that will either block or enhance the protein's normal function within the body. Though crystallographic techniques can be used to determine a protein's structure, this powerful technique has been limited by problems encountered in obtaining high-quality crystals well-ordered and large enough to yield precise structural information. Protein crystals grown on Earth are often small and flawed. The problem associated with growing these crystals is analogous to filling a sports stadium with fans who all have reserved seats. Once the gate opens, people flock to their seats and in the confusion, often sit in someone else's place. On Earth, gravity-driven convection keeps the molecules crowded around the "seats" as they attempt to order themselves. Unfortunately, protein molecules are not as particular as many of the smaller molecules and are often content to take the wrong places in the structure. During the STS-32 mission, 120 different PCG experiments were conducted simultaneously using as many as 24 different proteins. Though there are three processes used to grow crystals on Earth, vapor diffusion, liquid diffusion and dialysis, only vapor diffusion will be used in this set of experiments. Shortly after achieving orbit, either Mission Specialist Marsha Ivins or Mission Specialist David Low combined each of the protein solutions with other solutions containing a precipitation agent to form small droplets on the ends of double-barreled syringes positioned in small chambers. Water vapor diffused from each droplet to a solution absorbed in a porous reservoir that lines each chamber. The loss of water by this vapor diffusion process produced conditions in the droplets that cause protein crystals to grow. In three of the 20-chambered, 15-by-10-by-1.5-inch (0.38-by-0.25-by-0.04 meter) trays, crystals were grown at room temperature (22 degrees Centigrade); the other three trays were refrigerated (4 degrees C) during crystal growth. STS-32 was the first mission, during which PCG experiments ran at 4 degrees C, making it possible to crystallize a wider selection of proteins. The STS-26 and STS-29 experiments were the first scientific attempts to grow useful crystals by vapor diffusion in microgravity. 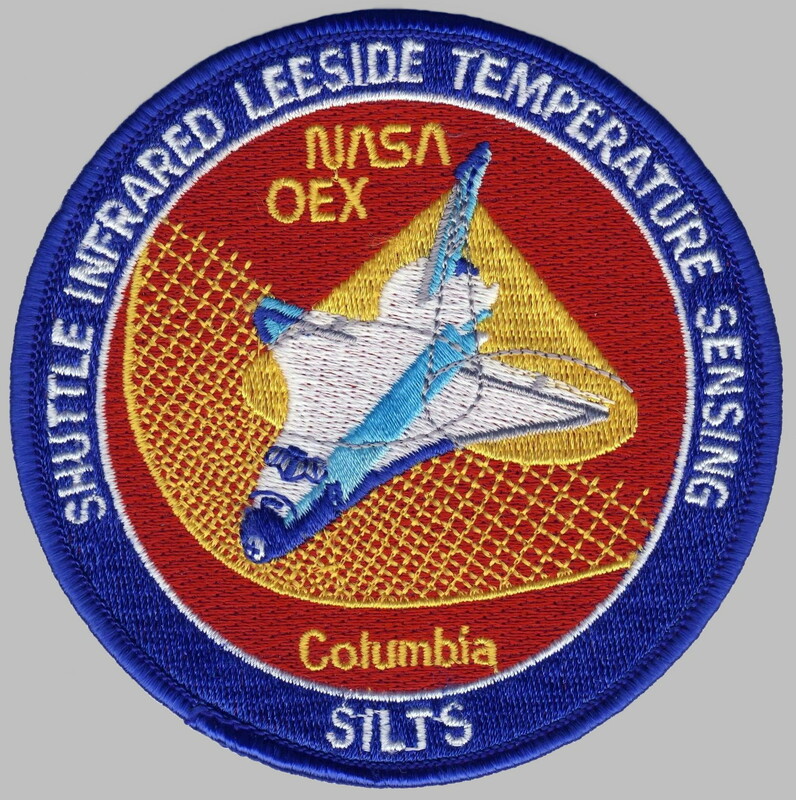 The main differences between the STS-26 and STS-29 payloads and those on previous flights were the introduction of temperature control and the automation of some of the processes to improve accuracy and reduce the crew time required. The Fluids Experiment Apparatus (FEA) was designed to perform materials processing research in the microgravity environment of spaceflight. Its design and operational characteristics are based on actual industrial requirements and have been coordinated with industrial scientists, NASA materials processing specialists and Space Shuttle operations personnel. The FEA offered experimenters convenient, low-cost access to space for basic and applied research in a variety of product and process technologies. The FEA was a modular microgravity chemistry and physics laboratory for use on the Shuttle and supported materials processing research in crystal growth, general liquid chemistry, fluid physics and thermodynamics. It had the functional capability to heat, cool, mix, stir or centrifuge gaseous, liquid or solid experiment samples. Samples could be processed in a variety of containers or in a semicontainerless floating zone mode. Multiple samples could be installed, removed or exchanged through a 14.1-by-10-inch (0.36 by 0.25 meter) door in the FEA's cover. The interior of the FEA was approximately 18.6-by-14.5-by-7.4 inches (0.47-by-0.37-by-0.19 meter) and can accommodate about 40 pounds (18.1 kg) of experiment-unique hardware and subsystems. The FEA mounted in place of a standard stowage locker in the middeck of the Shuttle crew compartment, where FEA was operated by the flight crew. Modular design permitted the FEA to be easily configured for almost any experiment. Configurations could change in orbit, permitting experiments of different types to be performed on a single Shuttle mission. Optional subsystems included custom furnace and oven designs, special sample containers, low-temperature air heaters, specimen centrifuge, special instrumentation and other systems specified by the user. 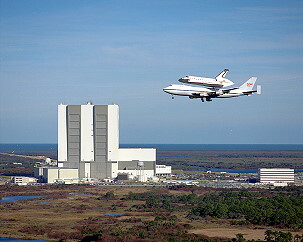 Up to 100 watts of 120-volt, 400-Hertz power was available from the Shuttle orbiter for FEA experiments. 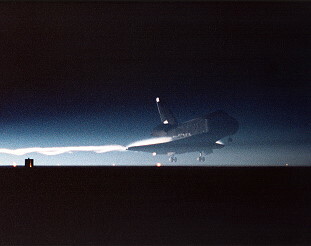 The FEA was successfully flown on two previous missions, as a student experiment on STS-41D and as the first flight of the FEA on STS-30. Space Shuttle mission STS-32 again carried the Mesoscale Lightning Experiment (MLE), designed to obtain nighttime images of lightning to better understand the global distribution of lightning, the relationships between lightning events in nearby storms and relationships between lightning, convective storms and precipitation.The Space Shuttle payload bay camera was pointed directly below the orbiter to observe nighttime lightning in large, or mesoscale, storm systems to gather global estimates of lightning as observed from Shuttle altitudes. Scientists on the ground analyzed the imagery for the frequency of lightning flashes in active storm clouds within the camera's field of view, the length of lightning discharges and cloud brightness when illuminated by the lightning discharge within the cloud. The IMAX project is a collaboration between NASA and the Smithsonian Institution's National Air and Space Museum to document significant space activities using the IMAX film medium. This system, developed by the IMAX Systems Corp., Toronto, Canada, uses specially designed 70 mm film cameras and projectors to record and display very high definition large-screen color motion pictures. 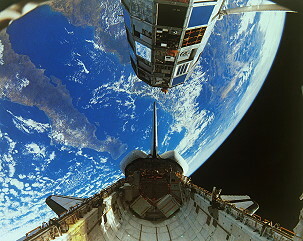 IMAX cameras previously have flown on Space Shuttle missions STS-41C, STS-41D and STS-41G to document crew operations in the payload bay and the orbiter's middeck and flight deck along with spectacular views of Earth. Film from those missions form the basis for the IMAX production, "The Dream is Alive". 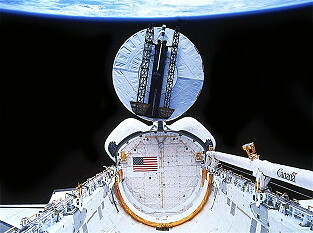 So far in 1989, the IMAX camera has flown twice, during Shuttle missions STS-29 in March and STS-34 in October. During those missions, the camera was used to gather material for an upcoming IMAX production entitled "The Blue Planet". During STS-32, IMAX filmed the retrieval of the Long Duration Exposure Facility and collected additional material for upcoming IMAX productions. The Air Force Maui Optical Site (AMOS) tests allowed ground- based electro-optical sensors located on Mt. Haleakala, Maui, Hawaii, to collect imagery and signature data of the orbiter during cooperative overflights. 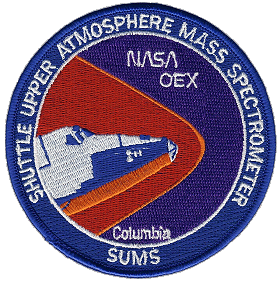 The scientific observations made of the orbiter, while performing reaction control system thruster firings, water dumps or payload bay light activation, and were used to support the calibration of the AMOS sensors and the validation of spacecraft contamination models. 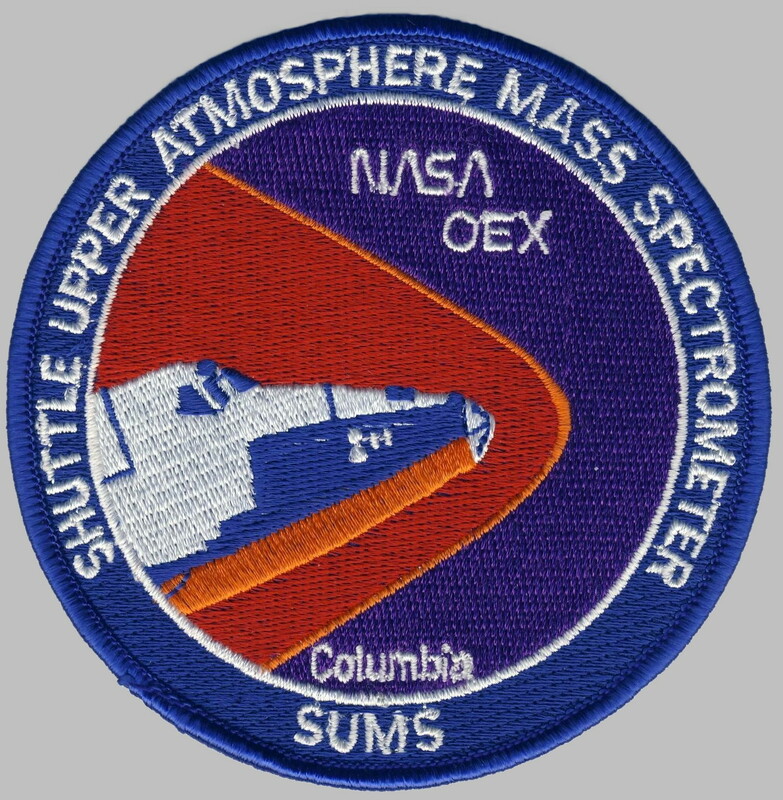 The AMOS tests had no payload unique flight hardware and only required that the orbiter be in predefined attitude operations and lighting conditions. 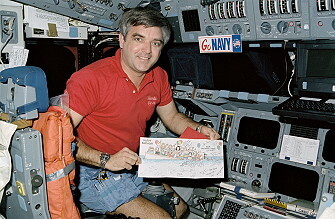 On Shuttle mission STS-41G, Payload Specialist and oceanographer Paul Scully-Power observed numerous unusual oceanographic features from orbit but was unable to determine their exact locations for subsequent study. NASA, in conjunction with the Department of Defense, began work on an instrument that would be able to determine the precise latitude and longitude of objects observed from space. The Latitude-Longitude Locator (L3) was developed and flown on a previous Space Shuttle mission. This flight continued tests to determine the accuracy and usability of the system in finding the latitude and longitude of known ground sites. L3 consisted of a modified Hasselblad camera equipped with a wide-angle 40 mm lens, a camera computer Interface. Crew members took two photographs of the same target at an interval of approximately 15 seconds. Information was fed to the GRID computer, which computed two possible locations. The crew, by knowing whether the target is north or south of the flight path, was able to determine which of the two locations was correct and the target's latitude and longitude. Last update on February 22, 2019.